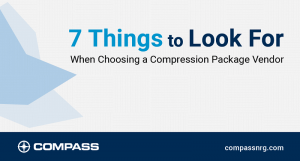 Once your compression package vendor completes initial engineering work, it’s time to build. How efficiently will engineering drawings turn into the powerful, precision equipment your company needs? That’s up to the art and science of project management. At Compass’s Calgary, Alberta facility, Engineering Manager Mike Drury points to a track record of 1,000 projects since 2001. What makes this kind of productivity possible? Compression equipment manufacturing depends on powerful tools, exacting engineering and high-pressure logistics. You might call that the science of project management. The art comes by harnessing the human factor – experience, persistence, creativity – through collaborative, real-time communication. Compass uses SharePoint software to power collaboration and problem-solving throughout the project management phase. As Drury explains, it’s a true difference-maker. One thousand projects in, Compass commands a project management process that’s proven to deliver. Still, no one wants to stop there. They’re pushing for more.